Why oh why did it take me so long to read this book? It was such a fast-paced rollercoaster of a read that I could hardly bear to put it down. 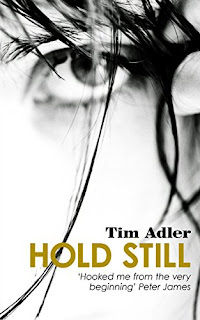 It may be my first Tim Adler book but it certainly won't be my last. Paul and his wife, Kate, are visiting Albania in order to attend his uncle's funeral. I had read the blurb but I still let out an involuntary gasp of shock as Paul jumped off the hotel balcony. Seconds before this happened his wife, Kate, had taken a photo of him and Paul had promised that they'd always be together. Why would he say that then commit suicide? When Kate examines the photo more carefully, she notices a face in the background on her hotel balcony. Who is he and what does he have to do with Paul's death? Understandably, Kate is struggling to cope with Paul's desk so she turns to grief counselling and meets a man called John Priest - a man whose face also appeared in her Albanian photographs. Who is he? What's going on? My mind was in a complete whirl as I tried to work out what was going on but nothing could have prepared me for the journey that this book took me on. A real page-turner of a read, Hold Still will have you on the edge of your seat until the very last page.